Bakers across the country are seeing red and baking every delicious variation on traditional red velvet cake. If you are hoping to hop in on the red velvet trend, check out these decadent desserts. From easy, no-bake crispy treats to a showstopping raspberry red velvet bundt, all of these bright-colored chocolate treats are equal parts pretty and tasty. The only problem is deciding which one you'll try first. 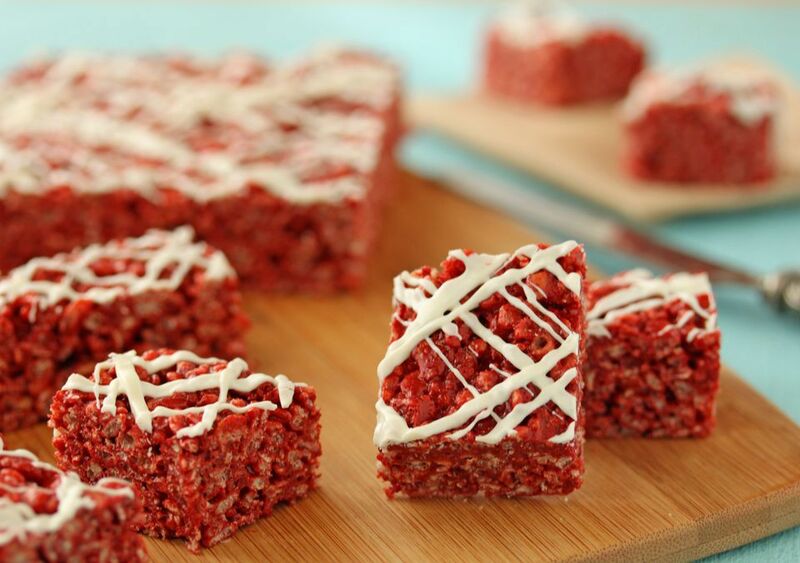 Take your crispy rice treats to the next level just by adding some dry red velvet cake mix to the recipe. These red velvet crispy treats are a wonderful departure from the norm, and drizzled with some white chocolate glaze or cream cheese frosting they're unbeatable. For a sweet Valentine's Day morning treat, or to just make any morning a little more special, try these red velvet pancakes drizzled with cream cheese frosting. A package of red velvet cake mix makes these pancakes a vibrant shade of red. Top with some red fruits or whipped cream to make them even more outrageous. These delicious truffles are made with red velvet cake and cream cheese frosting, dipped in a white chocolate candy coating. These adorable eye-catching bite-size sweets are a unique addition to a bake sale table or party spread. Using red-velvet flavored vodka, this red velvet cocktail truly takes the cake. Made with muddled strawberries, lemon juice, and cream soda, this cocktails takes only three minutes to whip together. It's a playful dessert cocktail to round out the end of any dinner party. Excited about all these red velvet cake recipes but can't commit the time? Make a personal red velvet cake on the go with the recipe for a red velvet lava mug cake. This is one the easiest ways to satisfy a red velvet craving and make a delicious, melt in your mouth lava cake in mere minutes. This recipe uses a special doughnut pan to get that signature round shape. But this also means there's no frying. Red velvet doughnuts are round little cakes that only need to be baked in the oven for ten to twelve minutes, drizzled with easy frosting and sprinkled with red sugar. No list of red velvet recipes is complete without a classic layer cake recipe, and this red velvet cake is one of the best. The frosting is a smooth, light and not overly sweet traditional custard frosting. It's made by boiling milk and flour and then mixing it into creamed butter. But if you prefer it, you can always replace it with cream cheese frosting. What would this list be without the comfort standby? These red velvet cupcakes need cocoa powder, red food coloring, and buttermilk for that moist signature red velvet flavor and look. Look at the bottom of the recipe for how to make classic cream cheese frosting, (or buy your own if you're in a rush). Those with dairy allergies need not miss out on all the red velvet fun. These red velvet cupcakes are completely dairy free and yet they don't sacrifice any flavor. They are made with soy margarine, soy yogurt, soymilk, and dairy-free frosting. If chocolate crinkles are one of your go-to cookies, you should absolutely try out these red velvet crinkles. Perfect for any red-themed holiday such as Valentine's Day, Christmas, or even Fourth of July, these cookies are sure to be a hit. A pretty, layered trifle is easy to make and just a little out of the ordinary. This red velvet trifle uses perfect round discs of from-scratch cake, layered with raspberries, blueberries, blackberries, and strawberries to compliment the red velvet flavor. Follow the simple instructions to make your own custard filling. 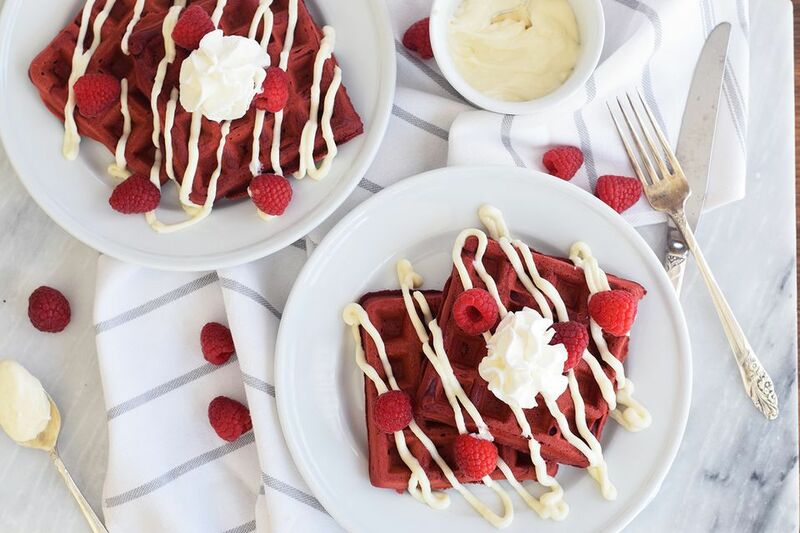 Red velvet waffles are great way to start any day, not just holidays. With bittersweet chocolate chips and dark cocoa powder, these red velvet waffles are particularly rich and chocolatey. With homemade frosting drizzled on top and some raspberries, these waffles are hard to beat. If you've mastered classic red velvet cakes and red velvet cupcakes, it's time to try your hand at this raspberry red velvet bundt cake. The complex flavors of red velvet, actual raspberries baked into the center, and a lemony cream cheese glaze make this cake special. These adorable tiny red velvet cheese cakes are a cream cheese base cooked in a muffin tin. Top these little minis with some whipped cream and chocolate shavings and take them to your next party. They're also easily frozen and defrosted so you can make them ahead. Want in on the red velvet action, but can't spare the sugar? These easy red velvet mug cakes are completely sugar-free, and really tasty. Whip one up in the microwave in minutes for a last-minute evening pick me up without the guilt!